While Mike and I were traveling I needed to be on social media. Mostly I needed to be on so that family and friends and my parents could make sure we were safe and doing well. We did everything from Pinterest, to Twitter, to LinkedIn and yes, even Facebook while we were away and they served their purpose. I was however never in love with any of these social media channels and I found facebook to be my least favorite one. When I learned that you could un-follow someone’s posts without actually un-friending them I realized it was all a fake numbers game and I set out to see how many people were actually even reading my posts. The number wasn’t as high as my follow number suggested so I un-friended everyone who had un-followed me. I mean if none of these people were even going to see or read my posts why on earth was I reading all of their posts I wondered? And if you can tune out someone exactly how is this social behavior? All of these supposed social media channels are therefore nothing more than media outlets. People want higher and higher follow numbers but they do not necessarily want to connect with anyone or have a dialogue on anything meaningful or even share anything useful with anyone else. There isn’t anything social about any of them. The other down side to all this social media sharing is where I began to learn how so many of the people I once considered good friends were completely misguided in their political and social views. Foolishly I thought that since we were friends in grammar school or high school we should still be connected today. It was through their postings on their social media channels that I learned that many of them had not evolved in their thinking and many of them were just not the sort of people I would want to associate with. I realized we just didn’t have anything to talk about. Learning so much about some of these people only saddened me more. Since the 2008 and 2012 presidential elections I have noticed an incredibly high number of postings (by people whom I assumed had high IQ’s) being posted without first fact checking the post. Some of the stories they posted were misleading while others were downright lies. This made me sit and wonder, didn’t anyone fact check anything before they posted? I think you know the answer to this. Realizing that all of these people were just exercising their right to free speech, and thinking ahead to the 2014 mid-term elections and the even more horrific thought about the 2016 national election still to come, I came to the larger realization that I too had free speech rights and I could do with my social media as I chose. And so I chose to hit the delete key. I wish I had done it months ago. Someone on LinkedIn recently asked everyone what they planned to do the second they retired. There were a ton of answers like sleep in, take longer vacations, play with the grandchildren more, but the response that drew the largest number of ‘likes’ was the man who answered, “stop doing social media”. What do I do with all my new-found free time now that I have deleted my facebook account? I’m reading more books, I’m writing more stories, I’m cooking and experimenting in the kitchen once again, I’m connecting with more fellow bloggers, and I’m taking longer walks. Oh, yeah…, and I’m smiling more. When we traveled I was always on the look out for something unique to do and for information to glean that was more about topics off the beaten path. 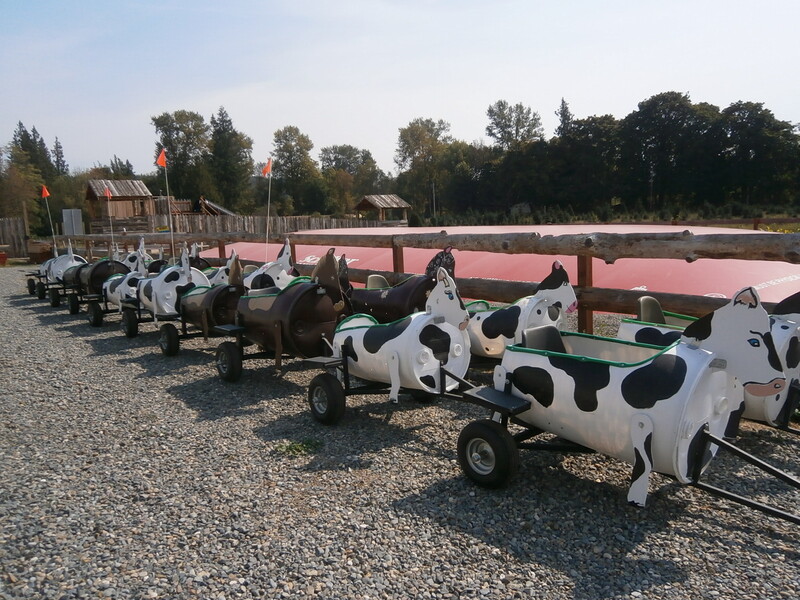 Even though we are currently ‘resting’ here in WA I am still constantly on the look out for something fun and unique to do here in the area and recently I stumbled upon Schilter Family Farms. 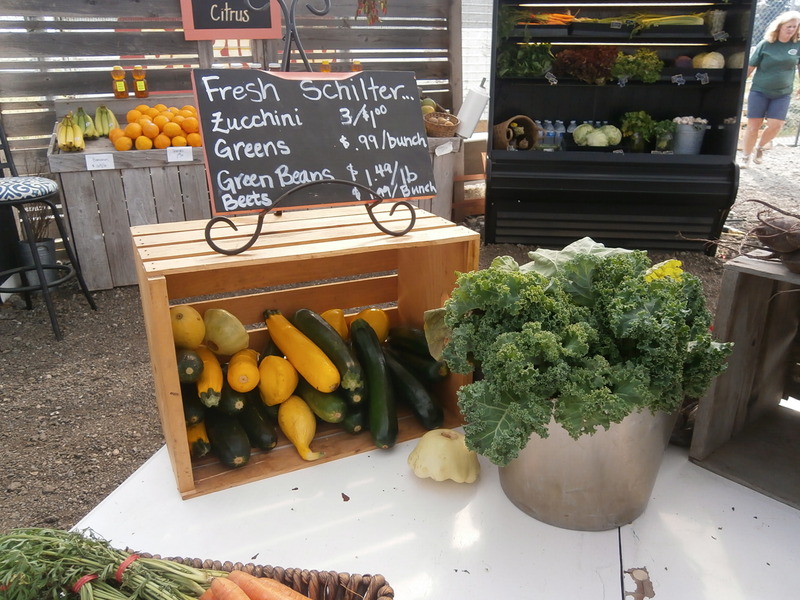 The farm began 75 years ago by the Schilter family who had emigrated here from Switzerland. At that time they were dairy farmers. Over time one of their sons decided that he wanted to help with the farming duties. That son, Fred was married to a woman named Patti. Fred and Patti had five children. 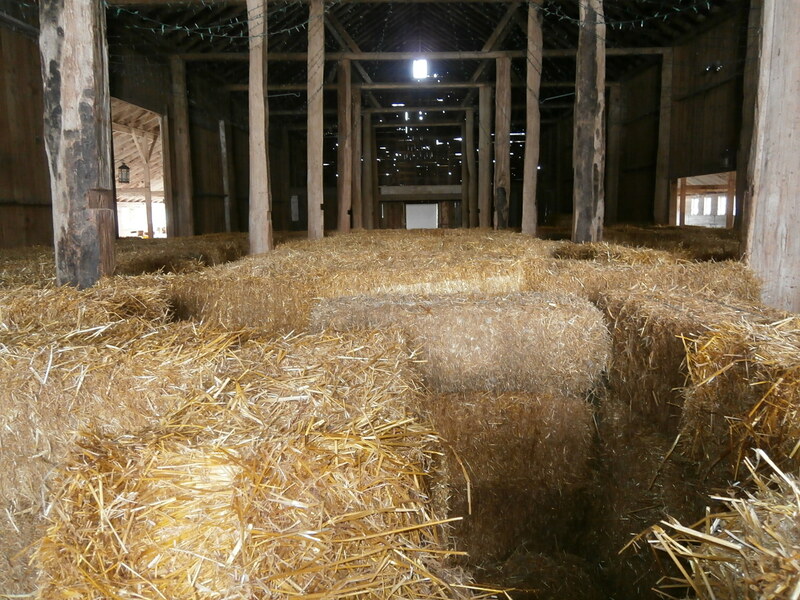 Over time the family phased out the dairy farm and decided to grow vegetables instead. Fred and Patti’s son Jeff decided that he too wanted to work on the family farm, and so it went. Today three generations of Schilter family direct descendents work on the farm. Sixteen years ago the family decided to begin building corn mazes for the general public to enjoy. 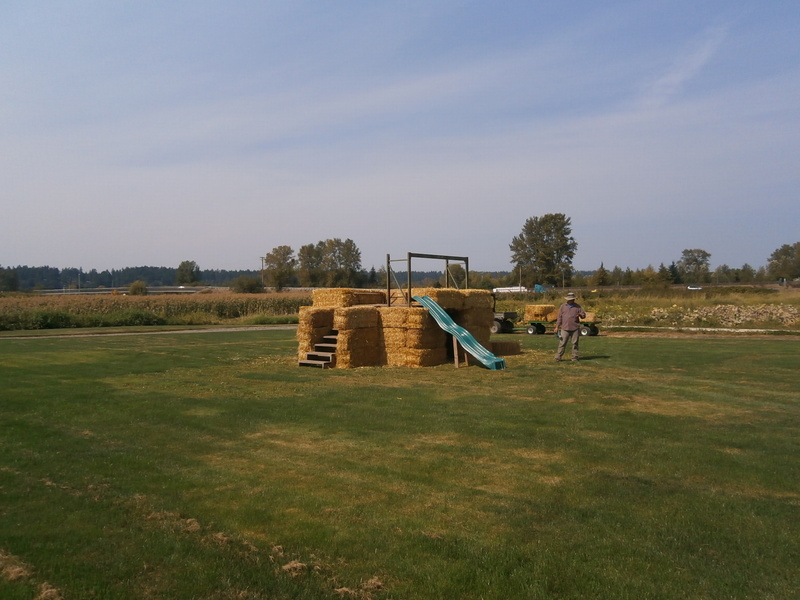 It was the first corn maze in Thurston County, WA. They offer a different corn maze theme every year which they design themselves. 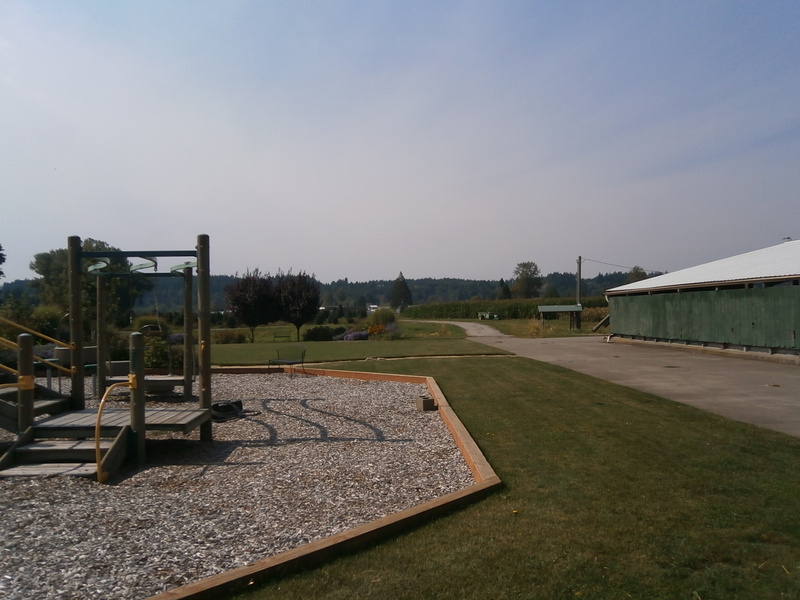 In the past they have had a Mariner Maze (that is Seattle’s major league baseball team), a CSI- Corn Scene Investigation maze, a Kasey Keller Corn Maze (born in Olympia Kasey played professional soccer with the Seattle Sounders), and last year’s Big Foot Corn maze. This year however marks the 75th Anniversary of the movie, The Wizard of Oz, so it makes sense that this years maze would be dedicated to the movie. Complete with a swirling tornado, a little house and a tree this 5 acre, 10’ high corn maze will be open to the public from September 27th through October 31st. You have one hour to make it through the maze before they send in the flying monkey’s to help you get out (I jest but someone will come looking for you to make sure you don’t spend the night in the maze). There will be signs and markers from the movie along the way and a map to help you traverse the whole thing. Fall is my favorite time of year. It always has been. With the leaves turning spectacular and bright colors to the chill in the air, to the cooler temperatures and the need to wear layers of clothing I’m a happy girl. I also have the opportunity this weekend to walk through my very first corn maze. I’m excited. All of the traveling I’ve done around the world and I’ve never had the opportunity to walk a corn maze and now it’s going to come off my bucket list. The only thing is I don’t know if I should be singing ‘Somewhere Over the Rainbow’, or ‘Oh, What a Beautiful Morning’. Either way, and with either tune, I’m off to see the wizard. My husband loves hot and spicy foods. He adds jalapeno’s to my homemade soup. He puts hot sauce on just about everything I make. Not because it doesn’t take good but because it would taste better if it was on fire (I jest, he just loves spice in his foods). No matter where we have traveled in the world Mike was always on the lookout for hot sauce we could buy and keep in our refrigerator. Sometimes he found hot sauce and mostly he didn’t. In countries where one would expect to find good homemade hot sauce, like Spain, Panama or even Mexico, hot sauce just wasn’t as readily available. While living in Mexico Mike searched for weeks until he stumbled upon a small local and independent restaurant not too far from where we were staying that made hot sauce. It was so good Mike went back week after week and the owner was incredibly pleased. Finding good hot sauce during our three years of living abroad was the exception however, not the norm. What I didn’t know was that in all our travels Mike secretly harbored a desire to do one of those eating challenges where hot sauce took center stage. They don’t really do eating challenges outside of the US so he never had the opportunity to test his endurance, until recently. Just down the street from where we are now living in Lacey, WA is a sushi restaurant named Koibito’s and they host a 5 Star Sushi Challenge. 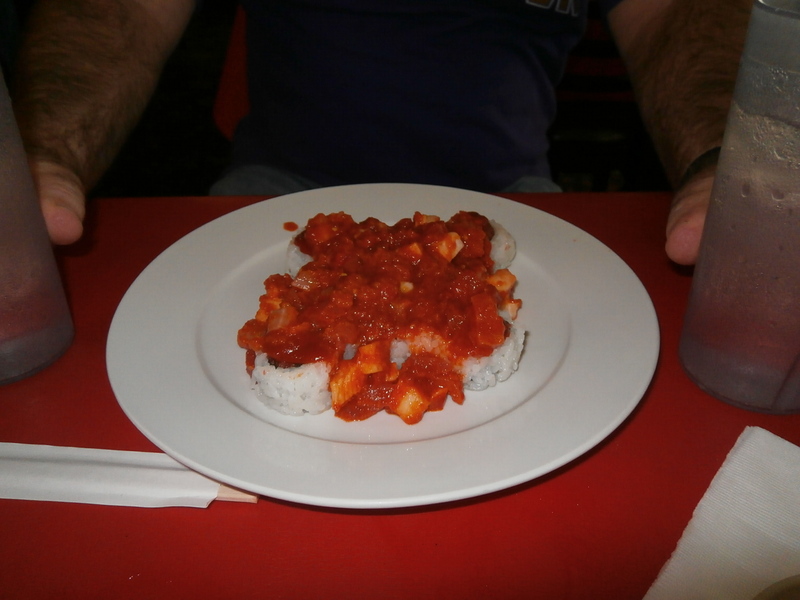 This challenge consists of the challenger eating eight pieces of sushi covered with a five pepper and spice hot sauce. The sauce is marinated with cabbage and tofu. The sushi roll was made with hot and spicy tuna. The challenger has to eat all eight pieces of the sushi roll and all of the hot sauce in 30 minutes or less. I will personally attest to the fact that when his plate arrived at the table I could smell the hot sauce from across the room and it lingered for a time. There was no way I was going anywhere near his plate. Mike started off strong and ate the first three pieces in under a minute and a half. At piece number six however Mike took a deep breath, sort of coughed and then I thought he was going to lose his lunch. He said the cough made the hot sauce permeate completely up and into his sinuses and that’s when his eyes began to water and he began to sweat. And yet he kept on chewing, slower, but he kept on. Piece eight loomed large. There was a lot of hot sauce and cabbage / tofu mix that had to be consumed with it and so with chopstick and fork in hand Mike got piece eight ready. At this point you are reading along and wondering what on earth was all this for, right? What possible prize would be worth all this agony? 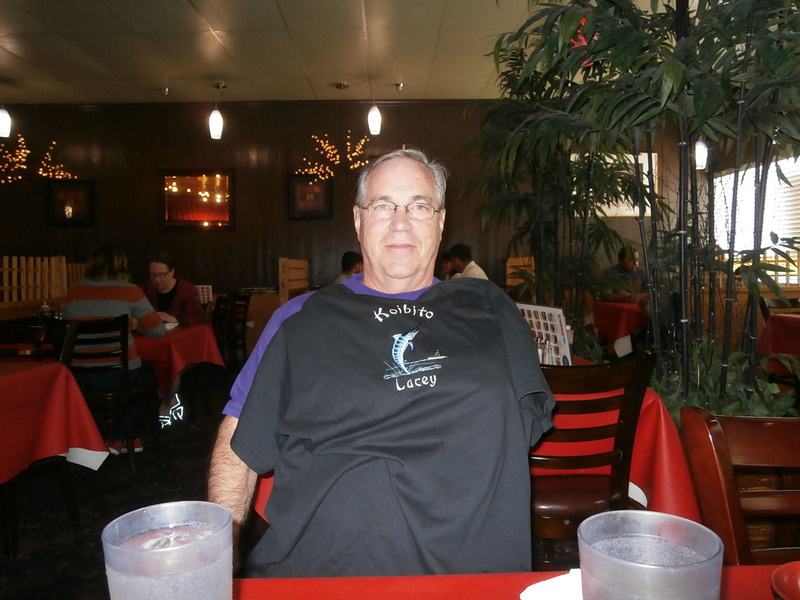 Mike is the proud owner of an awesome new T-shirt! As for me, I am proud of my little fire eater. 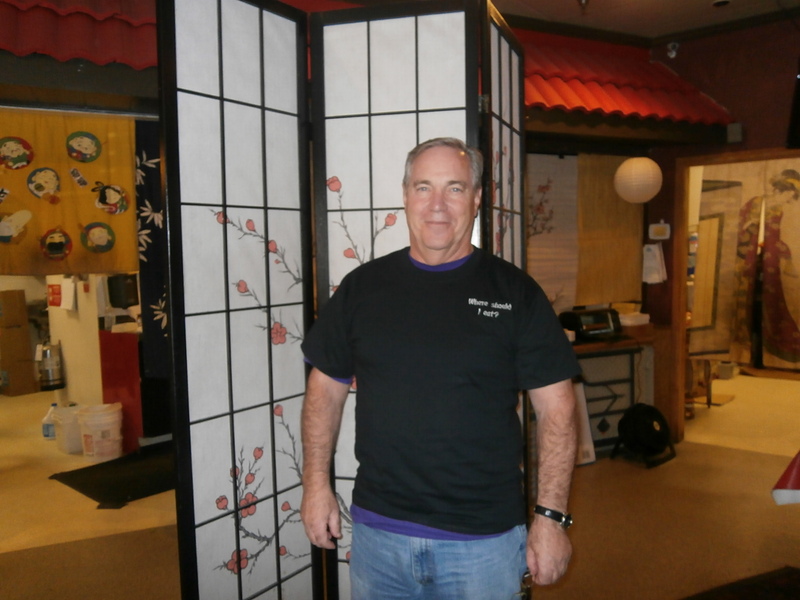 If by some chance you ever make it inside Koibito’s make sure to look for Mike’s picture on the wall of champions. I have made a video of Mike’s success which you can watch here. It took him 5 minutes and 20 seconds to finish the challenge. Recently I interviewed for a writing job. What I heard them say during the interview process made me do a double think. Their stance was that bloggers, and blogs in general, were considered worthless poppycock because of the lack of journalist integrity shown by blog writers. Blogs, as far as they were concerned, were badly written, the bloggers did not have credible sources and no blogger did any research on their topic. They wrote just what they thought off the top of their heads. In essence, every blog on the internet was baseless as far as they were concerned. Since I have three blogs I listened to all this hyperbole with my eyes wide open and my mouth firmly closed shut. If you know me at all this was a momentous occurrence. Who on earth were they trying to sell this ridiculous notion too I wondered? According to the latest statistical data, there are 172 million blogs on Tumblr and 75.8 million blogs on WordPress. That’s a whole lot of nothing going on. Now, I am aware that not every blog online is active. I have seen many of them in my searches on various topics and sadly I know the blog has been deserted. There are, however, plenty of blogs online to read on a variety of subject matters; travel, food and civil rights are among my top three. Most people who are blogging that I have read are knowledgeable on their chosen topic, passionate about what they are doing and able and ready to write a blog to help others. I guess I don’t read the blogs they were referring too because none of the blogs I read fit the stereotype of the blogger that they opinioned. Maybe I am just fussier than most. I don’t read every blog out there of course and over time some blogs are no longer relevant to me and I look for something else to read. I also have to be moved greatly to even post a response on a blog because some blogs are interesting but do not require my feedback. It also depends on the mood I’m in when I read them. I know this company just wanted to make their job seem more than it was, but to disparage an entire enterprise with nonsense and downright lies made me wonder. If their objective of being a leader in the communication industry was so tenuous that they had to disparage bloggers in general, did I even want to work with them? So, to all the blog writers and bloggers I read and follow, keep up the good work. Get your references annotated, make your links bold and bright and keep up the good fight. I’ll be reading. Yesterday Mike and I attended the very first Nordic Heritage Day here in Olympia, WA. Mike and I love attending ethnic fairs and festivals and earlier in the week I had connected with the President of the local Sons of Norway chapter to learn more about this festival. As is usually the case we met some awfully nice people who are very proud of their heritage and simply wish to share it with others. Mike and I are only too glad to learn more about other cultures and their way of life while we are here in the US and deciding on what countries to explore next. Going to festivals and fairs is therefore research for when we grab our passports and head off again to live among and with the locals. I therefore created the video, using original Norwegian music, to highlight some of the sights we saw yesterday at the very first Nordic Heritage Day. Sharing Part Two of my time with the owners of Encore, Chocolates and Teas. *This is part two of my visit with Dean and Carla Jones from Encore, Chocolates and Teas. Part one was posted on my Reflections blog and can be foundhere. When a visitor enters Encore, Chocolates and Teas the number of tea jars is of course the first thing that strikes you. It is when you begin to tour the store that the chocolate isle beckons. Everyone loves chocolate. At least everyone I know. Mike likes white chocolate and I love milk chocolate. Because of my new vegan lifestyle however I was wondering what I was going to do about my sweet tooth, which strikes periodically. As many of you know Mike and I visit Farmer’s Markets in every city that we have lived in and traveled too. 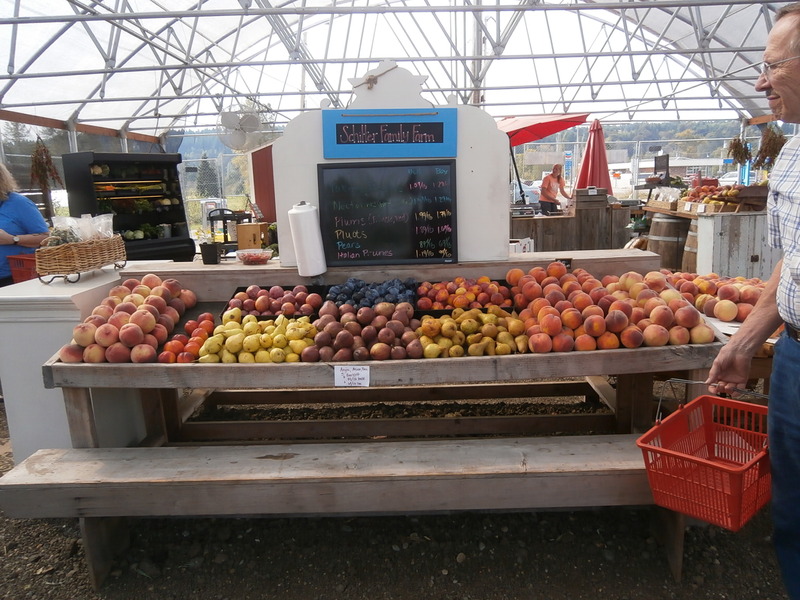 Because the ‘famous’ farmer’s market here in Olympia has become a tourist trap and the prices are through the roof I have been hunting for an alternative farmers market. We are after all eating vegan which means we eat an awful lot of vegetables, fruits, nuts and grains. Create an open-air location for healthful shopping, workplace events and information-sharing for state, city and library employees. 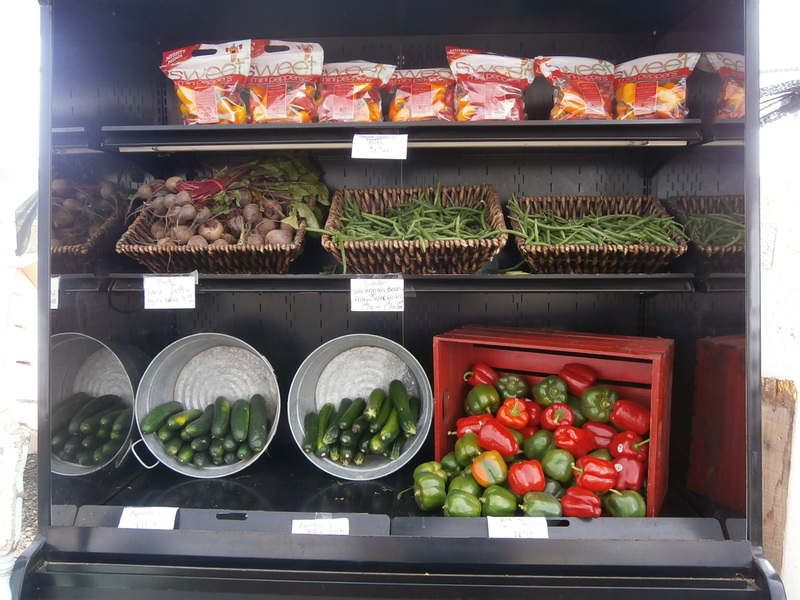 Increase consumer access to fresh produce by being able to buy directly from local farmers. Provide a public space for state employees and others to gather. One of the unique features of this farmers market is the access to a community booth where local groups can display information of importance to the community as a whole, or to promote an event. This past Wednesday, September 3 Dahlia growers and enthusiasts were asked to enter their blooms into a contest to choose the best Dahlia. 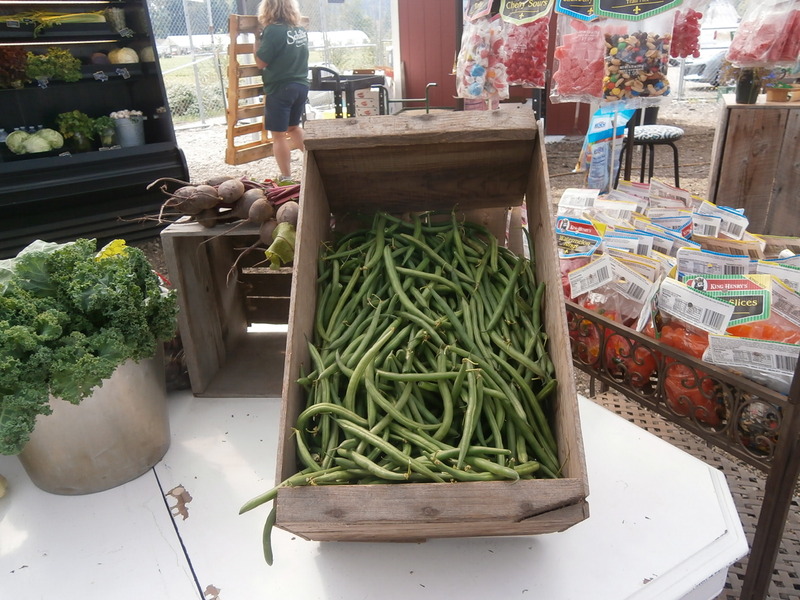 There was no cost to enter and the grand prize came from Barn Nursery. Any public group, state or municipal agency or nonprofit organization may sponsor the community booth for a market day. The cost is $15. The booth may be used for outreach on topics of public interest or for public education on topics of concern to the community. The booth is not to be used for soliciting, political, or religious activities. 8 Arms Community Bakery (baked goods) This could be dangerous! The market has an active Facebook page. If you live in the area Like it to get updated vendor information on the weeks market activities. 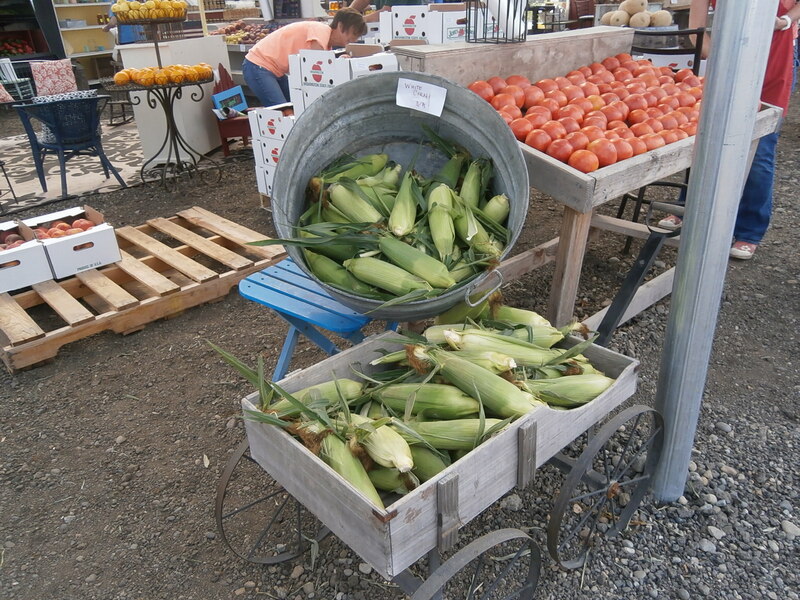 The Tumwater Town Center Farmers Market will conclude its 2014 offerings at the end of October. The market is located at the corner of Capitol Blvd. and Israel Road and is open every Wednesday from 11:00 a.m. to 2:00 p.m. The market is also served by local transit which runs every 15 minutes during the day. 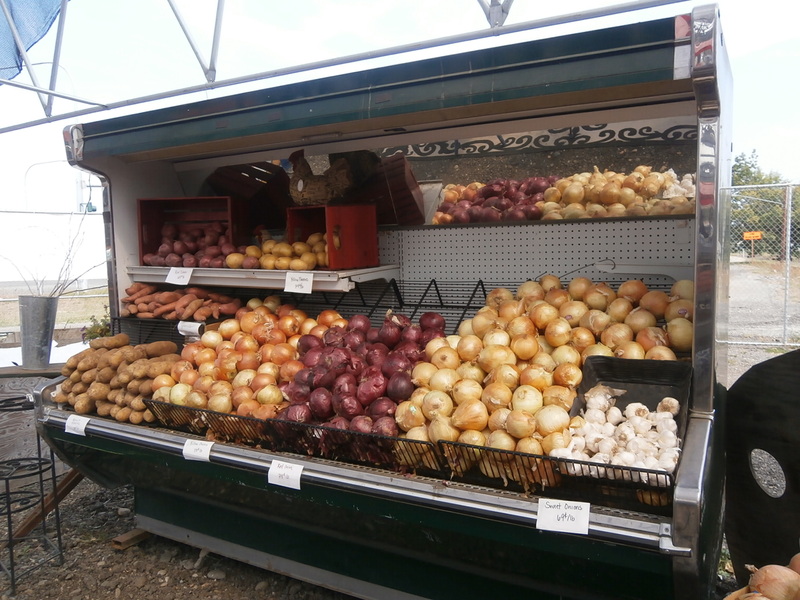 They have a picnic area so that you can enjoy the live music and a hot lunch while shopping for your vegetables. Mike and I tried Lupe’s Tamales and you will learn more about Lupe in an upcoming post.